Fly fishermen in the lower 48 drool at the thought of wetting a line in the final frontier of Alaska. The landscapes are incredible, the fishing extraordinary, and the solitude found while fishing in such an isolated wilderness is unparalleled in our country. But planning a fly-fishing trip to Alaska is an overwhelming experience. A man couldn’t fish the entire state in a lifetime, let alone during a weeklong trip. There are simply too many lakes and rivers full of fish. So, to help you avoid the paralysis of analysis caused by the plethora of Alaskan fisheries, here are the 15 best places to fly fish in Alaska. The Kenai is one of the most iconic rivers in Alaska. Its 82-mile long trek from Kenai Lake in the Kenai Mountains takes it to the Cook Inlet off the coast of the Kenai Peninsula. The River is deep and wide, and divided into three sections: Upper, Middle, and Lower. This river is most famous for its King Salmon runs that occur every year. Its King Salmon aren’t as plentiful as in other Alaskan Rivers, but these fish are known for their size, not their numbers. King Salmon in the Kenai River weigh between 40 and 90 pounds. The Kenai River is also home to sockeye salmon and pink salmon, as well as massive rainbow trout and Dolly Varden. It is not known as being a steelhead fishery, but there are regular reports of steelies being caught. While fishing on the Kenai, you’ll be surrounded by moose, bears, and more waterfowl than you can count. It’s a true Alaskan experience. 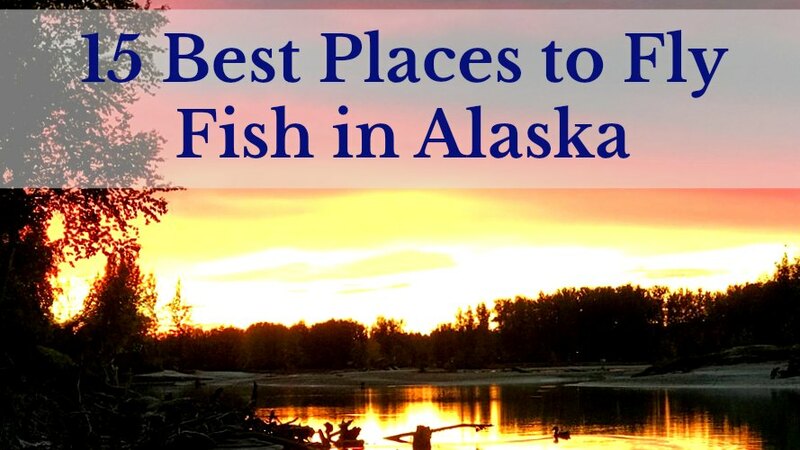 Unfortunately, due to the famous reputation of the Kenai River, it is not only the most famous fishery in Alaska, but it’s also the most popular. Every year, about 275,000 people fish on the Kenai. Fishing the Kenai is still worth it, even if you have to throw some elbows and employ some combat fishing tactics. But if you’re like me, you much rather fish away from the crowds. To get there, you’ll have to get off the beaten path. The first 12 miles of the Kenai are up in the mountains, and are gentle flowing. From there, the river enters Kenai Canyon, where the whitewater roars and inexperienced rafters get beaten up. After the canyon, the river calms down for 3 more miles until it reaches Skilak Lake. This entire section, which totals 17.3 miles, is known as the Upper Kenai. Fishing is crowded on this section, but you can fish it by accessing the river here at the Russian River Campground. After leaving Skilak Lake, the river gently travels for another 10.5 miles until reaching an area of especially turbid water known as the Naptowne Rapids- this area should not be attempted by any novice boaters. The fast water continues again for the remained of the Middle River section, totaling 19.5 miles. The best way to fish the Middle section is by drift boat. The Kenai River is a massive fishery, so there are tons of flies that will work effectively during a given time of the year. Here are some of our favorites. The Kasilof is just south of the Kenai River. Separated by just 11 miles, the two rivers share the same species of fish, similar water conditions, and ecology. But the Kasilof is different in notable ways. Unlike the Kenai, it doesn’t have lakes to interrupt the river’s flow. Therefore, the river is more glacial and turbid than the Kenai. That doesn’t diminish the quality of the fishery, though. The Kasilof is also a more protected fishery- unlike on the Kenai, motorized boats are not allowed. The Kasilof is drift boat only. The Kasilof River’s most admirable characteristic, though, is that the fishery gets much less pressure than other large rivers in the area. This is where you will find the isolation and aloneness that Alaskan fishermen crave. Fishermen on the Kasilof are also allowed to continue fishing after harvesting a King Salmon, unlike on the Kenai. These Kings also weigh between 25 and 40 pounds, with 50 and 60 pound fish being caught on a regular basis. The Kasilof is a hidden gem of the well-known fisheries in Alaska. Fishing there will give you the opportunity to catch a trophy King, Sockeye, Rainbow, or Dolly Varden, all while avoiding the crowds. In the fall, steelhead arrive in large numbers and continue to remain until November. The Kasilof is so close in proximity to the Kenai and so similar that you’ll be successful using the same flies. The Russian River on the Kenai Peninsula connects to the Kenai River. The much smaller Russian is primarily fished during the two Sockeye runs that occur in the early and late summer. Tens of thousands of these fish rush into this tributary each year. But the Russian River can also be an incredible trout fishery. To avoid the crowds, fish the Russian River when the sockeye aren’t running, and target the rainbows and Dolly Varden that permeate the system. Fishing during these times is productive and will give you the solitude you desire. Of course, you can fish during the salmon runs as well, but you will be surrounded by people. The Russian River is the smallest we’ve talked about so far. It is perfect for wading, but you still must take appropriate precautions. The big boulders in the Russian are extremely slippery and the water is freezing cold, so be sure to wear studded rubber sole wading boots- felt sole boots are not legal in Alaskan waters, so don’t even bring them. There is public access to the Russian in the Russian River Campground. You will find paths and stairways that take you straight to fishing holes and more paths to get to more fishing holes. If you’re traveling the bank of the river, stick to the paths. The Alaskan Department of Fish and Game is making an effort to restore the shore habitat on the Russian. If you need help selecting flies for The Russian River or anywhere else, checkout this FREE Downloadable Hatch Chart. Now we’ll talk about some less well-known locations. Lake Creek is an undeservingly named river about 60 miles northwest of Anchorage. It’ll take you about an hour to get there if you’re on a plane taking off from Lake Hood. The river flows out of Cheltna Lake and flows into the Yetna River. Most people fish the intersection of the two rivers. Lake Creek holds all 5 species of pacific salmon, rainbow trout, arctic grayling, and northern pike. You can cross every species off your Alaskan Bucket List here. But the river’s biggest appeal is the solitude. Lake Creek doesn’t experience the combat fishing found on Alaska’s more famous rivers, and hopefully it stays that way for some time. An amazing home base for fly fishing Lake Creek is Riversong Lodge. Walter the owner takes pride in providing a true wilderness adventure that is only 35 minutes from Anchorage AK. Lake Creek’s King Salmon run begins at the end of May and runs until the middle of July. Kings here weigh up to 45 pounds and hit like a truck. You can only harvest one King per day, and 2 per season. After July, the 4 remaining salmon species run up Lake Creek: Silvers, Humpies, Dogs, and Reds. On Lake Creek in July, fishermen often have 50 fish days. Most of these fish will be around 5 pounds, but some weigh up to 20. Silvers are the best tasting of the 4, but the Dogs will put up the best fight. If you’re fishing Lake Creek, you need to fish at the Riversong Lodge. The Lodge was handcrafted from native spruce, and makes your rustic Alaskan fishing trip as luxurious as possible- the place even has a fully stocked bar. Each cabin at Riversong faces the Yetna River and has a view of the tallest mountain in North America- Mount McKinley. But besides the incredible fishing and beautiful accommodations, Riversong Lodge’s most enduring characteristic is their guides. The family owned and operated outfit is full of fun and caring people who love to fish, and their guides are all experts at fishing Lake Creek. Quartz Creek is a tributary to Kenai Lake. Once a hidden gem known only to local fishermen, the river is growing in popularity due to the Sterling Highway. It is still a productive fishery, though, especially for Dolly Varden. Salmon fishing on Quartz Creek is not allowed. Because the river is such an important tributary to Kenai Lake, the Alaskan Department of Fish and Game let the salmon rest here. But don’t let that keep you from fishing the salmon runs, as while these fish are laying their eggs, the Dolly Varden and the few rainbow in the creek are gourging on their eggs. Quartz Creek is crystal clear and has fast flows through plenty of subsurface structure. To get away from the crowds, fish just before the salmon spawn and get as far away from the road as possible. Bring your waders and bear spray. The Anchor River is another famous Alaskan River that can be accessed through Alaska’s road system. It is most famous for its King Salmon (Alaska’s obsession), but it also has strong populations of silver salmon, sea-run Dolly Varden, and wild steelhead. There are two tributaries to the Anchor that also hold good fishing- the Ninilchik River and Deep Creek. Both of these can be promising alternatives when the crowds on the Anchor get bad. During King Salmon season, the Anchor River is usually open for fishing only Saturday through Monday. So if you’re planning a trip, keep that in mind. The third largest Island in the United States is located off the southern coast of Alaska. Prince of Wales Island is a difficult place to travel to, as it can only be reached by plane or ferry. But if you can ever manage to get there, you’ll quickly understand why we’re mentioning it on this list. POW’s towering mountains coated in evergreens enjoy year round moisture, and that moisture cycles through the island’s many rivers and lakes. And those bodies of water hold every species of Pacific Salmon, as well as large populations of rainbow, cutthroat, and brook trout, steelhead, Dolly Varden, and arctic grayling. The beautiful scenery and incredible fishing on POW Island is accompanied by a dramatic lack of company. A day spent fishing on Prince of Wales Island will likely include 0 unplanned human interaction. Located inside Katmai National Park and Preserve near Bristol Bay, American Creek is an iconic trout river. Its headwaters start in the Aleutian Range before emptying into Lake Coville. Brown Bears, Bald Eagles, and all of the iconic Alaskan wildlife thrive in and around American Creek. But you’re here to learn about the fishing. American Creek is a prolific rainbow trout and arctic char habitat. The river is low and clear in the summer, making it an excellent dry fly fishery, but fishermen also find success with streamers and egg patterns. Every season, trophy sized rainbows are caught in American Creek. The Kulik River is the shortest on this list. At just two miles long, it appears a strange destination for a trout fisherman. But, since the small river runs between Nonvianuk and Kulik Lake, it has a consistent flow and is filled with trout food- it’s one of the most dependable trout fisheries in Alaska. The hardest part of fishing the Kulik is getting there. Since it’s located in the Katmai National Park and Preserve near Kodiak, your only option for getting there is going to be a float plane. Once you do get there, though, you’ll be in wade fishing heaven. The Yukon is not the typical cold water river that you’d expect to fish in Alaska, and therefore, it isn’t the best destination to catch trout, char, or salmon. But what the Yukon does have is one of the best northern pike fisheries in the state, and a thriving population of sheefish (if you’ve never heard of a sheefish, look them up. There’s a reason they’re called the Tarpon of the North). This river is also smack dab in the middle of nowhere. A day spent fishing on the Yukon is a day spent fishing alone. The Kcichak River is sourced in Lake Ilimina and runs 50 miles into Kcichak Bay. This water contains all 5 pacific salmon species, but that’s not what it’s famous for. When the salmon start to run, fisherman flock to the Kvichak to fish for rainbow trout as they gorge on salmon eggs. This is one of the few special places in Alaska where fishermen commonly catch 30”+ rainbows. Located in southwestern Alaska, the 75-mile long Knaetok River runs out of the Ahklun Mountains and into the Bering Sea. The river is mostly gentle flowing, with some difficult sections of rapids. It holds Chinook, Cogo, chum, and sockeye salmon, as well as Arctic Char, rainbow trout, and arctic grayling. There is public access to the River, but you will likely need a drift boat to effectively fish it, and a guide would be a great decision. The 35 mile long Naknek River is in Bristol Bay near the village of King Salmon. As the name of the town suggests, this is a prolific salmon fishery- specifically known for its sockeye. But the river also holds massive rainbows, steelhead, and Dolly Varden. A convenient 60 mile drive from Anchorage on the Parks Highway, Willow Creek is one of the most popular fly fishing destinations in the state. It holds king, silver, pink, and chum salmon as well as massive rainbow trout, Dolly Varden, and Arctic Grayling. I highly recommend passing up the salmon fishing, and targeting the beautiful and aggressive Grayling instead. Baranof is another large island off the southwest coast of Alaska. Like Prince of Wales Island, it is a massive area dotted with productive fisheries. Getting there is the most difficult part, but once you’re there the fishing makes it all worthwhile. Have you ever met someone and just thought to yourself “These are good folks”. The perfect day trip or as a recommendation multi-day trip is Riversong Lodge (link to website with contact information). First class guides, fine dining, an excellent location all make this lodge a great fly fishing vacation. The lodge is just far enough away from civilization to get the true feeling of being in Alaska, but close enough that it becomes a “chore” to get there. I highly endorse Riversong Lodge and owner Walter Zaleski and Family. Listing the recommended fly fishing gear for Alaska is like listing the recommended gear for fishing in North America. It’s an incredibly large area with a diversity of fishing that is indescribable. For grayling and rainbow trout in “small” streams, a 5 weight will be perfect. But if you take that same rod onto the Kenai, a hooked King would quickly instill regret in your decision-making. If you can only bring one fly rod, bring a one hand 7 weight. If you can bring only two, bring a 6 and an 8. If you can bring three, bring a 6 weight, 8 weight, and an 8 weight spey rod. But, since you’re in Alaska, there is a good bit of other necessary equipment you must have whenever you’re on the river. Bear spray can save your life and is more effective than any pistol, rifle, or shotgun you can carry. Don’t enter the wilderness without it. If you’re fishing in remote areas, don’t fish alone. Getting lost or stranded in the Alaskan wilderness is no joke.